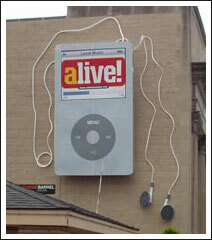 A Columbus, Ohio, magazine called Alive! has set up this giant working iPod billboard in the city’s downtown area. The playlist is kept online, so passersby can look up the songs they hear while passing the ad. It also takes requests. It’s unclear whether Apple had to approve the use of the iPod image, or if it even knows about this. Via MacDailyNews.